Paper Chains & Garlands: Easy to make decorations, for parties, holidays, and home décor is an original ebook by June Gilbank. Turn your next celebration into a creatively crafted occasion to remember. Create delightful decorations on themes that range from the seasonal (snowflakes, autumn leaves, cherry blossoms) to the decorative (pleated flowers, pinwheels, elephants). The illustrated instructions by expert crafter June Gilbank show you how to fold, cut, unfurl, and string chains and garlands like a pro. 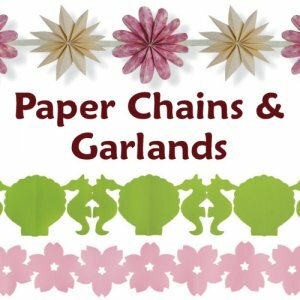 With tips on how to cut simple paper dolls as well as elegant Chinese lanterns, Paper Chains and Garlands is the perfect craft book for expert crafters as well as beginners. The new 2nd edition ebook, exclusively available from PlanetJune, is even better than the original book! It has been fully revised and updated, includes bonus content and has 10 pages of printable templates that are sized to print correctly onto either A4 or letter-sized paper and available in multiple sizes so you can easily create your paper decorations in a size you like. Simply print the template you want, at the size you want, onto a sheet of cardstock and cut it out to create a long-lasting reusable template that you can draw around over and over again, to make as many decorations as you need! This craft book is very well written. The directions are written clearly enough for my 10 year old daughter to read and understand on her own. The designs are both kid and adult friendly. My youngest loves the elephants, my personal favorites are the cherry blossoms and lanterns. This book was a gift for our 13 year old niece because it reminded me of the days when girls used to weave chains out of gum wrappers and create artistic things out of scraps of paper. Making arts and crafts sparks the imagination and it is a great way for kids to develop hand-eye coordination; much better than texting and playing computer games. You don't have to buy fancy or expensive paper to make these chains either; you can use left over gift wrap, old magazines and newspaper, and the never ending supply of junk mail we get everyday. With these projects you can try your hand at origami, papercutting, and a variety of other papercrafting techniques, all explained in my clear, easy-to-follow style with step-by-step illustrations. If you've been looking for some fun craft projects to try with the kids, inexpensive ways to decorate for parties and holidays, or just want an easy introduction to papercrafting, look no further! Date Added: 11/18/2015 by Jana H.